At 7:30am, Jen swung by and I hopped in her white VW (Golf?). Like Speedracer, she maneuvered her little German car expertly on the highway. 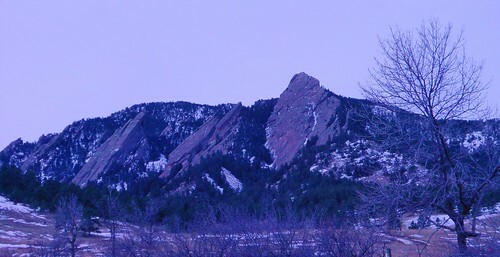 In 40 minutes we were at Chautauqua parking lot staring at the Flatirons. 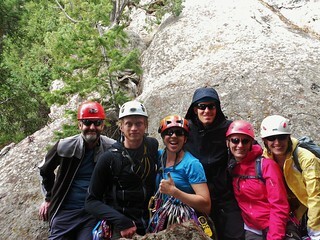 What was the climbing going to be like? Would we be successful? 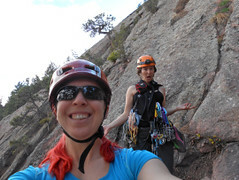 The days are longer and spring is upon us, so I decide to join Erin for an afternoon of climbing The Spy. Unfortunately, we miss the proper start and she ends up creating her own line. 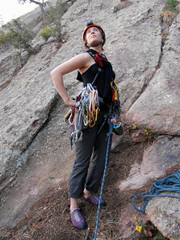 She veers back on route, but by then, it’s too late to finish the climb. We are cheered by the discovery of an orange metolius cam which is wedged in a horizontal crack. It looks a bit worn but still new enough to make a recovery effort worthwhile. She works on it a little bit, then I do, then we give up. Meanwhile two dudes who are soloing come along and give it a whirl. They can’t get it out either, so as sun is setting, we get our nut tool back from them and retreat to the comforts of Boulder.